LAKEWOOD, NJ, UNITED STATES, August 13, 2018 /EINPresswire.com/ -- In the night of one's life, there is always someone or something that serves as a kind of lantern. For Eugene McCann, the teachings of St. Benedict have become his inspiration in life. Thus the birth of his book entitled The Journey of My Life: Part Two. Eugene McCann teaches at Simon Fraser University. Being a professor in the Department of Geography, his research focuses on urban politics. His shares how his life changed when he became a believer of St. Benedict. His first book, Jesus Was & Is Always with Me: Throughout My Life unlocks how McCann sees the positive side of life. It teaches a lesson that nothing is impossible when one lets Jesus in his life. The first installment of his book, The Journey of My Life: Part One is a compilation of the teachings of St. Benedict. It allows one to see himself and others where one gets to wake up and begin to change his life – Benedictine spirituality comes in. 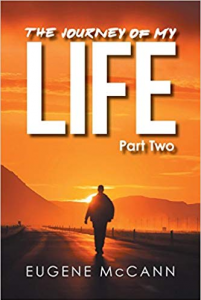 The Journey of My Life: Part Two does not only show the author's daily journey, it also gives facts about St. Benedict and his miraculous works. The readers are invited to read and become inspired by the author's journey.